Numerology is the scientific interpretation of numbers and the incredible impact they have on our reality – and when a number repeats, it reflect its message in triple the intensity. Numbers are the realest unchanging truths in our Earthly existence, so the Angel Number 444 is one that possesses a very special frequency and energy within its vibration. Angel Number 444 contains many different components within its weight. 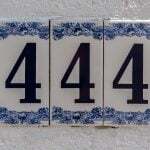 To fully comprehend the vibrational weight of Angel Number 444, we will need to understand the energy of each element within…meaning the Number 4 and the Number 3. In Numerology, the Number Four is considered to be “The Worker” of the cardinal numbers. The 4 is basically “the salt of the earth,” holding a masculine-based vibration that is reflective of strength, method, stability, organization, and foundation building. For example – there are 4 elements (water, fire, air and earth), and 4 sacred directions (north, south, east and west). These are undoubtedly two of the cornerstones of our current existence – the foundation of so many things in this lifetime. Other significant vibrational attributes carried by the 4 include: practicality, dependability, obedience, productivity, and patience. This frequency is conventional and persistent, while leaning more toward traditionalism than toward idealism. Even looking at the shape of the 4 reflects the inborn energy of it. The harsh and straight angles are symbolic a straight-edged and simple, yet stable, frequency. There is a common saying, that someone can be considered to be a “square.” Basically, this means they are boring, and/or follow the rules to a tee without deterring from tradition. Notice though, that a 4-sided square has zero weak points! With 4 equilateral sides, the spiritual significance of the square is absolutely reflective of solidity, organization, perfection, and being built to last. In addition, it is helpful to know that the 4th sign of the zodiac is the cardinal water sign Cancer, and the 4th card of the Tarot deck is The Emperor. 4+4+4 = 12. 12 reduces to 3, since 1+2 = 3. The 3 also possesses the frequency of the teachers, prophets, and healers of our time. We are referring to those who were once human, but transcended physical limitations of the Earthly plane: The Ascended Masters. These illuminated beings encourage those who are awakened spiritually to seek even higher consciousness and evolved awareness, while offering spiritual guidance in many forms here in the physical. Therefore, the 3 also reminds us that our conscious and subconscious thoughts are always heard by the Universe, and are being responded to by divine and sacred energies. Some other aspects related to the Number Four include the 3rd sign of the zodiac,Gemini, and the 3rd card in the Tarot deck,The Empress card. Angel Number 444 contains a combined vibrational energy of the Number 4, Number 12, and essentially the Number 3. But remember, a repeating triple-digit number sequence intensifies the energy of that number; in this case, it is the Number Four. When Angel Number 444 shows itself to you, it is relaying a message relating to building foundations of lasting value, and knowing that the Universe is behind you every step of the way. If you embrace a practical and methodical way, and combine it with creativity and imagination, you cannot fail. If you are continuously experiencing Angel Number 444 in your daily life, note your thoughts during those moments – the entities of Higher power are with you at that moment, encouraging whatever energy you are putting out. It is a very strong probability that your current goals, thoughts and intentional actions are in alignment with the Universe, your personal soul purpose, life mission, and spiritual journey. Relate them to the vibrational weight reflected in the Number 4 and the Number 3, and your Higher Self will be sure to unveil the message that is meant for you.